Try our Penang Fried Hokkien Mee! Penang Culture’s Penang Fried Hokkien Mee! Introducing our seasonal new dish - Penang Fried Hokkien Mee ($7.95++). It comes with fresh squid, succulent prawns, a mixture of bee hoon and noodles braised in our signature prawn broth and a good dose of wok hei! Available from February till April 2019 only! Don’t miss it. So Shiok! Lobster Nasi Ambeng. Our popular Nasi Ambeng is back! And now even better - introducing the first ever Lobster Nasi Ambeng!! !A mega feast of Cheese baked lobster, Ayam Masak Merah, Mutton Rendang, French Beans with Tempeh, Sambal Eggs, Serundeng, Achar, Assam Curry Gravy, Vegetable Crackers paired with fragrant white rice. Perfect for 2 pax at an unbelievable value -$38.80++ only. Available for limited period only! 30 April to 15 June 2018. Popular Ms Tam Chiak tries our Penang Lor Mee and shares her views on it and on some of her favourite dishes at Penang Culture. What’s different about Penang Lor Mee? In Singapore, our version of lor mee uses black vinegar. But for Penang lor mee, they added white vinegar which is generally less acidic and has a milder, sweeter flavour. Penang Culture’s Lor Mee comes with delicious prawn mantis, soft braised wing, braised egg and a huge spoonful of white vinegar. Robust and soulful, the star of the lor mee is undoubtedly the gravy. It had a most intriguing flavour profile: savoury, sweet, garlicky and tangy. They imported their five-spice powder from Penang and it is much more fragrant. The pleasant tang was provided by the white vinegar. Somehow, all these flavours came together in a most magical way. Each flavour stood out, yet didn’t overwhelm one another. After giving a good toss with the minced garlic and chilli, it was a satisfying bowl of lor mee. She loves our Penang Sambal Fried Rice too! Besides the Penang Lor Mee, this is my favourite dish. 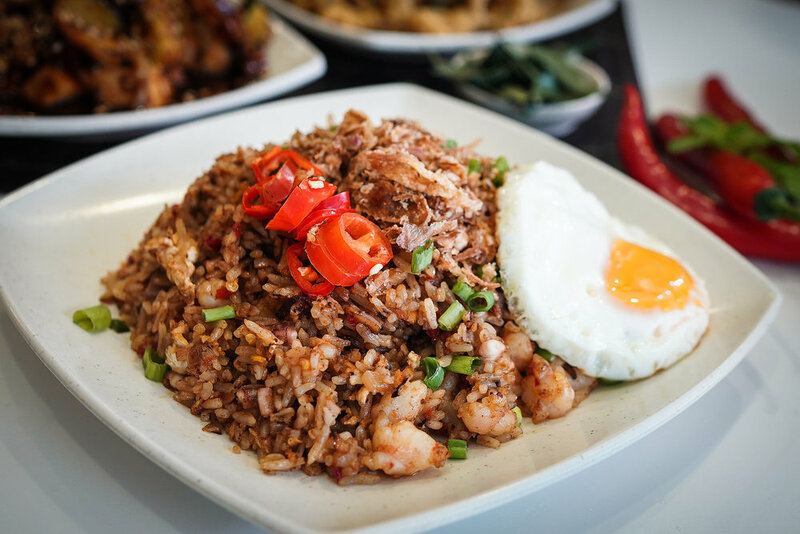 Chef’s fried rice is wok fried with his signature sambal, prawns and squid. Every grain is so fragrant and the sambal kick just leaves me wanting to shove another mouthful of tasty rice into my mouth. #Noregrets You can add another $1.50 for a sunny side egg. New Mee on the Block. Penang's famous Lor Mee is now in Singapore. So what's different about Penang Lor Mee? Penang Culture's Lor Mee comes with delicious prawn mantis, soft braised wing, braised egg and a huge spoonful of white vinegar. Available at all Penang Culture outlets from 5 March to 13 May 2018 only. You don't want to miss it. Promotional price: $5.95++. Have a Briyani end to the year! Have you tried our SEDAP Nasi Briyani yet? Featuring a golden chicken drumstick with fragrant briyani rice, tangy achar, crispy papadum and lemak curry. Usually $12.95++, now just $9.95++ through December 2017, so hurry on down! Cereals-ly, you have to try our latest dish. Fresh prawns stir-fried with crunchy cereal and curry leaves. Only $5.95++ (6 pieces). Available only for the month of October 2017 and for dine-in. National Day Specials at $5.20 in August 2017! Enjoy 8 of our favourite dishes at $5.20 this August when we celebrate Singapore's birthday. Available at all Penang Culture and Gurney Drive Signatures outlets. New! Penang Sambal Fried Rice and Salted Egg Mantis Prawns. Our new Penang Culture menu is out! And there are 2 absolute must try new items. Chef's famous sambal wok fried with fragrant rice, prawns and squid. The sambal kick will leave you torn between shoving another mouthful of tasty rice into your mouth or dousing the fire with a gulp of water. One thing is for sure, it will leave you burning for more. Salted Egg Lovers Alert - All we can say is 'Beware! This dish is highly addictive.' Salted egg paste coated on mantis prawns and fried to a crisp with curry leaves. It's deliciously savoury and crispy. Step aside, Salted Egg Crispy Fish Skin - make way for the new favourite Salted Egg Mantis Prawns! Come on down to any of our Penang Culture outlets now and try these new items. Or order them online and get them delivered by our delivery partners - Food Panda, Deliveroo, UberEATS or Honest Bee. It's the season to be feasting and catching up with good friends. Some love traditional Christmas favourites, and some love a little something more Asian. Don't fret. You can have the best of both worlds at our Penang Christmas Buffet. Enjoy Christmas Specials like Spanish Garlic Prawns, Herb Butter Mussels, Lamb Chop 'Diable', Turkey with Cranberry and Chef's Special Fish 'Angel'. Penang Favourites like Assam Laksa, Hokkien Prawn Noodles, Penang Lor Bak, Penang Fried Kway Teow, Penang Rojak and so much more. Not forgetting our fresh seabed items - mini lobsters, crayfish, scallops, fresh prawns, and salmon sashimi. Start making your reservations now! Enjoy discounts for large groups. BBQ Salmon a winner for Ms Tam Chiak! "My favourite for that night is BBQ Salmon ($11.95). Honestly, I would have never thought this is going to be the star for me. It doesn’t look really appetizing to begin with – two slices of Norwegian salmon fillet on a big plate. But but but, I am absolutely wrong. The fillet are first expertly grilled before a layer of Chef Wong’s secret recipe paste is added. That sublime sweet, spicy paste is very wicked – redolent with chilli, lemongrass, onions, ginger flower, assam (tamarind) and sugar. 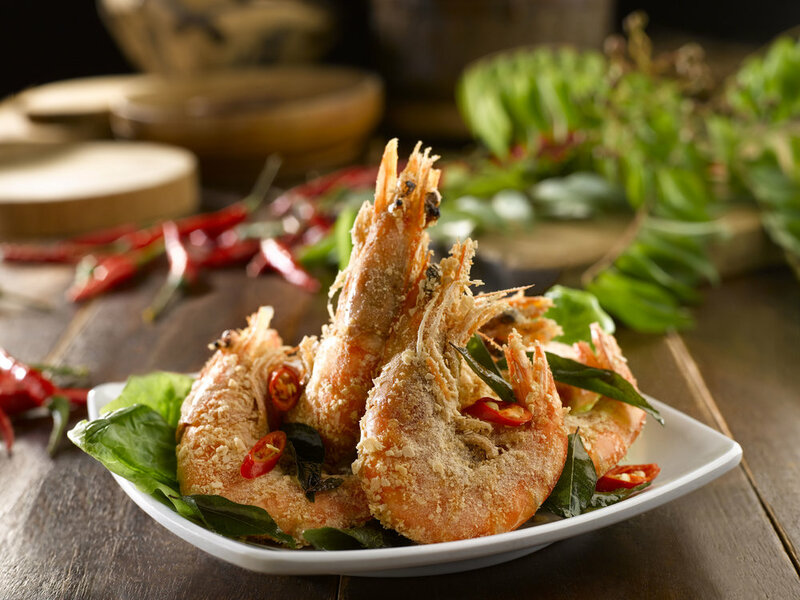 This same paste is also used on a selection of grilled seafood that is also available at the restaurant." Besides the BBQ Salmon, check out what Ms Tam Chiak had to say about Penang Culture's other new dishes like Premium Crab Meat and Salted Egg Fried Kway Teow, Premium Lobster and Scallop Prawn Noodles and the Penang Fire Wings. Oh, and just a note that these dishes are found at all Penang Culture outlets, not just at Changi Airport T2. Wong Ah Yoke Reviews Our New Menu Items! Premium Lobster & Scallop Noodles and Salmon Assam Laksa highly recommended by Wong Ah Yoke! Check out what food critic Wong Ah Yoke has to say about some of our new menu items. "... the Premium Lobster & Scallop Noodles ($16.50), which turns the humble Penang Hokkien prawn noodles into a gourmet version topped with scallops, slipper lobster, chicken pieces. fishcake, a hard-boiled egg and kangkong. What is important is that the broth is as rich as in the original hawker version, with the complex flavours of the prawns, crabs and chicken bones used to brew it. Another interesting dish is the Salmon Assam Laksa ($11.95), with slices of Norwegian salmon topping the noodles. Here again, the stock stays true to the original recipes, in which ikan kembong (mackerel) forms the base." Great Meal & Great Deal for All Students! It's after school and you are starving for your comfort food - a nice Western meal. Mum says no to fast food, but we are sure she won't say no to a wholesome meal of Penang Chicken Cutlet or Penang Fish and Chips. It comes with your choice of 2 side dishes (Pasta, Salads or Potato Wedges) and a choice of sauce (hint: the Salted Egg sauce, Chilli Crab sauce and Honey Lemon sauce are hot favourites). Top it off with a cool drink. All at a reasonable price. We know right, best deal ever! This Students' Meal is only available at Penang Culture @ JEM, Century Square and Changi Airport T2 Departure, from Mon to Fri, 2pm - 6pm. Try it and discover why our Penang Western Meals are so popular with students. Crab Buffet for Mothers' Day! Mothers' Day Crab Buffet Treat at Penang St. Buffet. Come celebrate Mothers' Day with our popular East vs West Crab Buffet! Mum gets to enjoy more than 15 unique crab dishes (Carbonara Crabs, Salted Egg Crabs, Wok Fried Crab Bee Hoon, Bali Crabs, just to name a few), fresh seafood (lobster, prawns, salmon sashimi, etc) and favourite Penang favourites like Penang Fried Kway Teow, Penang Rojak and Penang Cendol. Our crab buffet season ends on the Mothers' Day Weekend (7 & 8 May 2016). Available for lunch and dinner. Make your reservations now before it is too late. Email reservations@GDgroup.com.sg or call 6894 7872 to make your reservations before it is too late. "Eastern & Western Flavours Compete for Your Attention!" Meridith Woo from MyPaper describes some of her favourite dishes from Penang St. Buffet's East Vs West Crab Buffet. "Coconut also features in the Balinese crab. The savory and mildly spicy sauce, cooked with young coconut water, is best mopped up with some fried mantou." "The Carbonara crab, with strips of turkey ham, is pleasurably smoky and not heavy on the palate." Come enjoy the best of crab flavours at our halal-certified Penang St. Buffet. For a limited season only - last day 8 May 2016. Seth Lui features East vs West Crab Buffet! "Apart from the signature Chilli Crabs which Penang St. Buffet has in the house, I must highlight that the salted egg crabs was one of my favorites. Coated with a layer of hardened salted egg, the dish exuded an aromatic fragrance the moment I lift open the chaffer. On the whole, I am very much gratified upon my dining experience here at Penang St. Buffet. There was so much good food! Not only did it meet the satisfaction of a crab-lover in me, the dining experience was very much a hearty one which was a very accurate depiction of the Penang cuisine – traditional and genuine. Penang St. Buffet is an ideal place for heartwarming catch-ups and socialisation with family and friends, very much a friendly environment, one that you won’t feel ‘paiseh’ in getting your fingers dirty in the midst of cracking open crab shells." 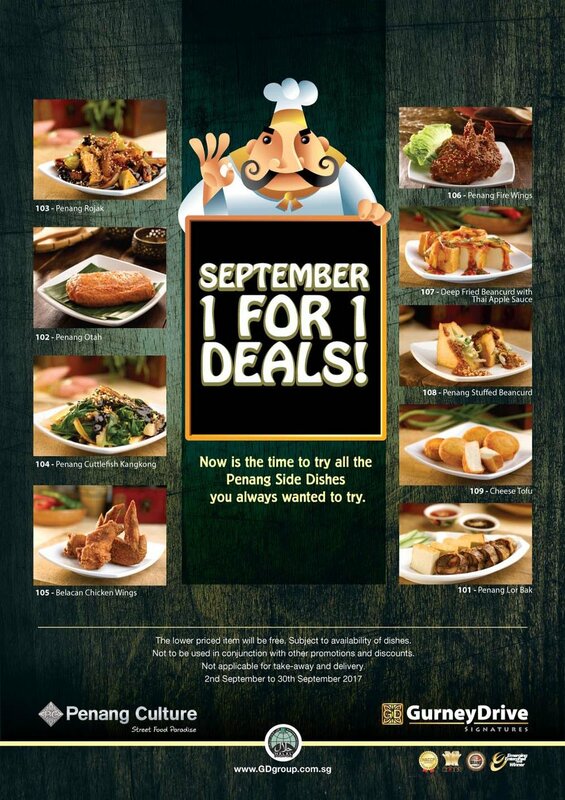 3. and be on your way to earning free meals and vouchers! Participating brands include Gurney Drive Signatures, Penang Culture and Penang St Buffet! The time has come for us to move from Jubilee Square. Sure we are sad to go, there are a lot of emotional ties attached to this place. However, we are excited about our new beginnings at Compass Point (which will be renamed as 1 Sengkang Mall). We know lots of our loyal customers who live in Punggol and Sengkang will be equally excited. Our outlet in 1 Sengkang Mall will be a Gurney Drive Signatures outlet. So, here's to new beginnings, and to more good years serving you authentic, Halal-certified Penang food. Our last day at Jubilee Square: 3rd April 2016.